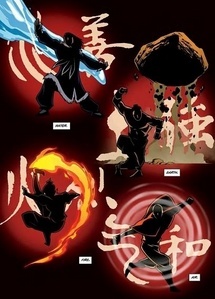 Aang intro : Water, _______, Fire, ________. Korra intro : ________, Fire, Air, __________. Air, Earth / Water, Earth. Earth, Air / Earth, Water. Metal, Sand / Sweat, blood. Fire, Water / Earth, Air.